For this half term I decided that the best plan of action was to have something to look forward to. So for the Saturday before the boys went back to school we booked the night in the LEGOLAND Hotel. 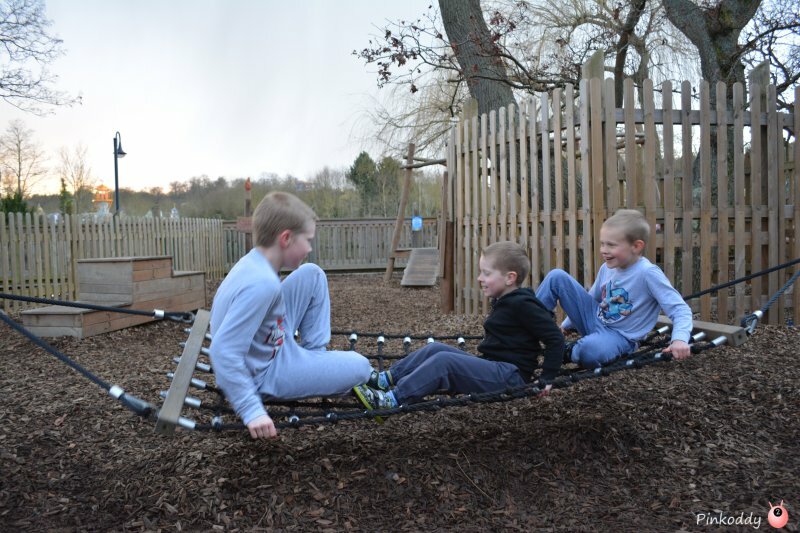 As the LEGOLAND Windsor resort is closed in February there was a Junior Builders Week. This included building with LEGO, special character appearances, taking part in building a mosaic, a disco and story – as well as a reduced rate of using the hotel and its facilities. Breakfast at Bricks Restaurant was also included in the price. 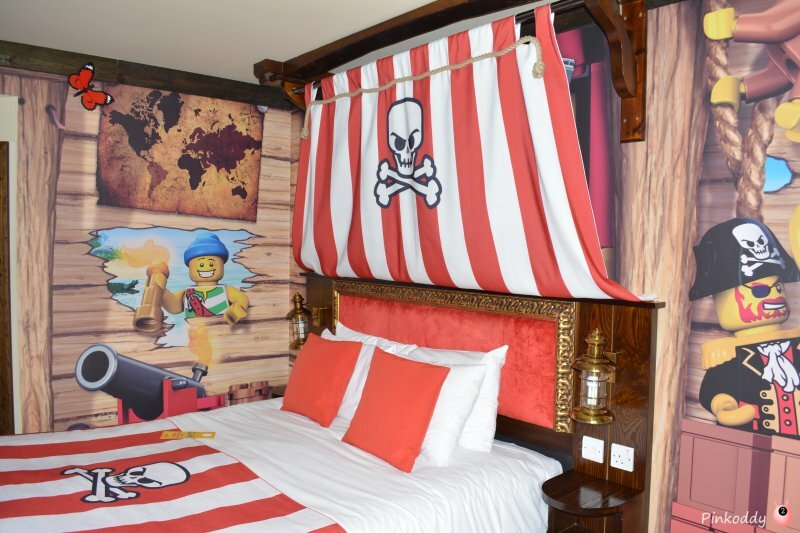 LEGOLAND Windsor Hotel is amazing. 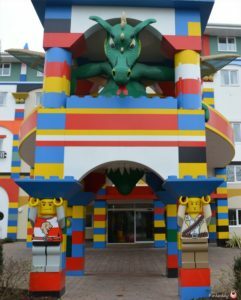 From the moment you pull outside there is some stunning LEGO work – with a smoke breathing dragon guarding the hotel – and other intricate details. The LEGO theme runs throughout with areas of both LEGO and LEGO Duplo to play with. Each month sees a different building challenge – and these are also displayed on shelves opposite the check in desk. We opted for the Pirates Premium room (with a view). I am really glad we went for the premium bit as it was nice that our side of the room was also themed. In fact the kids preferred our side and spent most of their time over there. It also meant that the boys each got their own lanyard and pop badge. I definitely recommend paying the extra £20 to get a view as it was really nice to see the park below (and lake and trees) as opposed to the carpark. The room was, as expected, amazing! There were so many wonderful LEGO touches – such as the soap in the shape of a LEGO brick. The children had to search the room to solve puzzles left for them in order to crack the code for the safe. I loved how my 7 year old immediately thought that the LEGO FRIENDS in the safe was for me, but then they were disappointed that there wasn’t enough bags. Thoughtfully though it was the same son who gave up his LEGO for me. In return I gave him a blind bag that I had been saving to make a video with. Check in was from 3pm where each of the boys were given a box of LEGO each ready for the builders challenge at 4:30pm. This was actually a bit disappoint as all it turned out to be was everyone sitting around just following the instructions in their boxes. The only thing extra we were all told not to mix up our LEGO with other people as there were no spare pieces. It was a bit chaotic and children were sitting almost on top of each other – that is those that hadn’t discovered the XBOX. I can see why there were computer games (with LEGO games on) but I was a bit disappointed that now my son just wanted to play (if he got a chance they were unsupervised, as were many of the children!). I had hoped he would have played LEGO bricks more and help with his fine motor development. The whole hotel is stunning and both my husband and I, as well as our children, were fascinated with all the detail. The stage area went upstairs (to more Xboxes) and was opposite a bar/lounge area and next to the Bricks Restaurant. It was easy to get around and find out where we needed to be, and the staff were always really helpful. We had a quick look on other floors and do think that the Pirate theme was the best. Of course the rooms on the first floor were not available as they are being redesigned into LEGO FRIENDS (which are available to book now for dates from March 27th 2015). 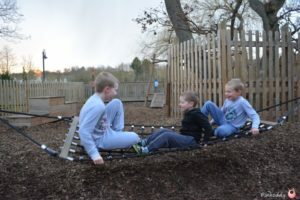 The children loved the play area (which is accessible via the Resort and the hotel) but did need a change of clothes afterwards. There was a great view of it from our window so if we had just brought our older son would have been able to allow him to go down there on his own. Other extras for Junior Brick Builder Week was the appearance of Move Stars Emmet and Wyldstyle: Being big fans of the film the boys thought that this was fantastic. The party dances and games didn’t seem to capture our boys’ interests and one of them did not feel very well so we returned to our room. The boys (after arguing who was having top bunk!) were then happy to settled down in front of their LEGO TV channel (well before deciding that watching it on our bed was better!). My 7 year old wasn’t very well and unable to sleep I decided to take him down to the reception area where he could play with the LEGO without disturbing the rest of our family. 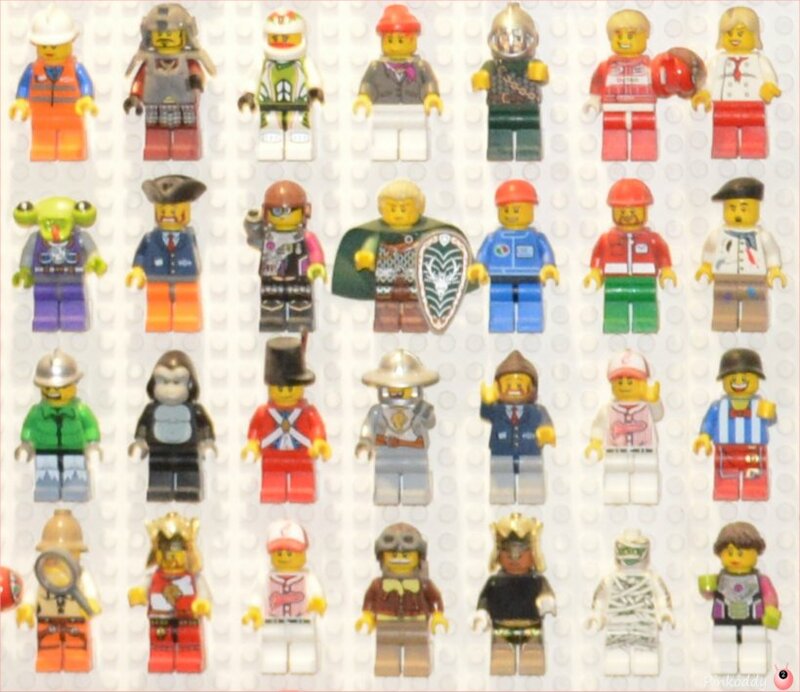 I have to say the staff were exceptional and he was delighted (as was I) to be able to go and have a closer inspection of the LEGO Minifigures wall. The Pirate Water Splash Play Area is open from 7am until 8pm. It is a real shame that there’s no photography but appreciate the reasoning behind this. There’s a LEGO pirate and parrot and great theming throughout. It is not too deep so children of all ages can play. There’s a see-saw that squirts out water to the other side, a slide and water cannons. There is also an “adult pool” which was deep enough just for my 7 year old to stand up in comfortably (think is 1.2). Bricks Restaurant was amazing. Again so much LEGO detail and thought put into it. The staff were superb, quickly and quietly getting on with their duties. We were shown to our tables and the boys each given a LEGO colouring in sheet (crayons were provided on the tables). I particularly liked the fact that there was a breakfast bar lower down so that children could help themselves to what they wanted (with plastic plates in the primary colours). The choice of food was amazing, it wasn’t too crowded (the hotel was booked to full capacity) and the smoothies were delicious. Best of all was the reaction when my poor little boy was very unwell – I would like to thank the staff for their kindness and patience. The Brick Building Activities in the morning included making part of the mosaic to become a fixture in the hotel, design your own POP Badge, Timed Tower building competition, LEGO free play and collecting a LEGO Juniors Builders Certificate. The boys really enjoyed themselves but I feel it may have been better organised. I was also disappointed that the final mosaic will not be made up of those who have built it – as they had to keep taking it apart as it was built too quickly. The POP badge section didn’t really have any instruction and only my 7 year old thought to copy the design over from his paper onto the badge. 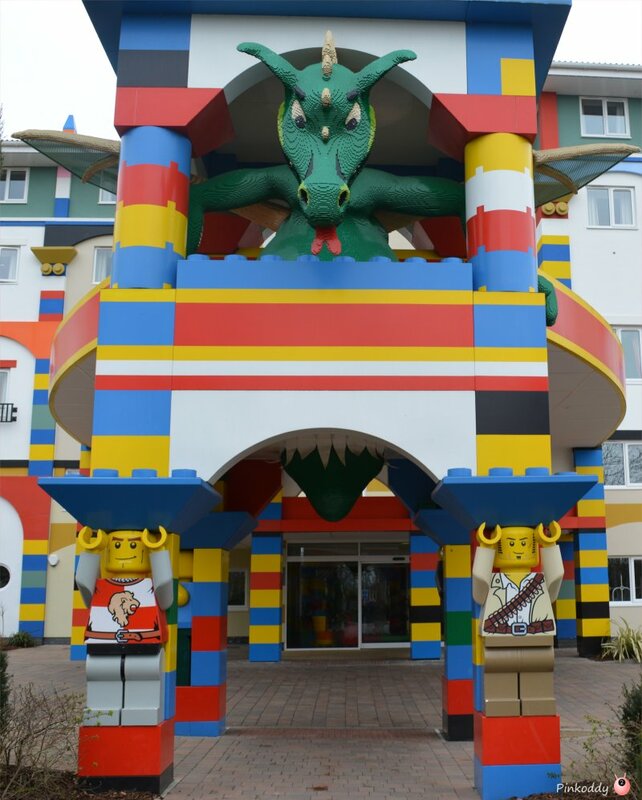 The Junior Builders Week at LEGOLAND Windsor Hotel was a good way to spend the night away to end the holidays. It was a fantastic treat and when considering the amount of LEGO we took home and the fact that swimming and breakfast was included in the price it was relatively good value. I did like how there was extra entertainment for the half term week seeing as the park was not open. We enjoyed ourselves so much that we have booked to go again. 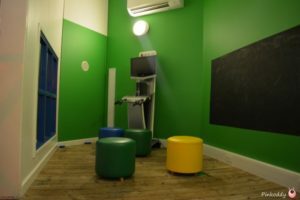 The Pirate rooms were on the third floor and slightly noisy so we have opted for the Adventure rooms on the top floor next time. I really fancied the LEGO FRIENDS rooms but they are only on the first floor and I do not feel my boys would enjoy their stay as much.